Weekend before last, The IndyCar Series was in Edmonton and the ALMS was near Toronto at Mosport International Raceway. Two standout performances were registered by drivers from the former ChampCar World Series and both performances were to set the fastest competitive lap in the their respective races. The two drivers, Sebastien Bourdais and Bruno Junqueira, it could be argued, were the most competitive drivers of the CCWS era. Sebastien, the perennial champion for four years straight from 2003 – 2006, and Bruno with near consecutive runner-up season performances from 2002, 2004, and 2005 (the last two as a team-mate to Sebastien). While the Frenchman (Bourdais) posted the fastest IndyCar race lap on lap 80 of an eighty lap race, the Brazilian recorded the fastest GT race lap posting a 1:18.102. Almost two hours into the race, Junqueira came into the pits to pass on the “fast cat” to Toronto area native and team-mate Ken Wilden, who drove the remainder of the two hour and forty-five minute race to take the checkered flag and salvage a 15th place GT finish. Bruno Junqueira entered the IZOD IndyCar Series full time in 2008 with a wealth of experience in open-wheel racing, including four starts in the Indianapolis 500. He earned the pole position at Indianapolis in 2002, driving for Target Chip Ganassi Racing [Further, he was able to qualify a car into the 33 car field of the INDY 500, only to be replaced by a primary or more strongly sponsored driver who did not qualify their car into the field (Alex Tagliani – 2009 and Ryan Hunter-Reay – 2011)]. Junqueira enjoyed success competing in Champ Car for seven seasons. With his 2005 win at Monterrey, Junqueira became the first driver in 19 years to win races in each of his first five years in Champ Car. He also finished runner-up in the series standings three times. Junqueira is part of a proud tradition of Brazilian open-wheel drivers, coming up through the Brazilian karting ranks and competing in South American Formula 3 and FIA International Formula 3000 before landing a ride in Champ Car. We last saw Bruno Junqueira on Pine Avenue during a fan appreciation activity the day before the cars took to the track at the Toyota Grand Prix of Long Beach catching the sights and sounds as just a fan in the crowd. We catch up with Bruno, now, just before Round 5 in the ALMS GT season of 9 races to be held at Mid-Ohio Sports Car Challenge. (1) Many teams call on your skills when they have a problem with their “regular” drivers, crashes, etc. But you haven’t been able to secure a ride in IndyCar. It’s almost a rhetorical question, but is it funding? A – There are many reason because I didn’t find a full time ride for the last 3 years in IRL. At Champ car, I was one of the winningest drivers and finished the championship 3 times 2nd. I was able to always find rides and win races and get paid. With the unification of IRL and Champ Car, it changed for me. I still did well, but I never got a good ride for the year. Probably, because in Indycar, more then half of the drivers have to bring money, or sponsors for the teams. Many good Champ Car driver struggle to find rides as well and the Champ Car team to find sponsors. (2) Just how difficult is it to secure funding in the present IndyCar series? A – In the last 12 years, I have been a professional driver. The correct is that the teams find the sponsor and hire the best drivers. It has changed, and I tried to find sponsor for 2010 season, but the TV rating in USA and Brazil made it hard to find money. (3) Do you think that the new IndyCar will make a difference in the competition tightening up? A – I think the new car will make the best teams have a bigger advantage. They will be able to develop the new car faster. (4) Does the ALMS GT series seem to have a chance at becoming a viable series? A – It already is viable. There are many manufacturers involved and a very good competition. (5) Do you enjoy this series as a continuation and evolution of your career? A – When I was 25, I thought that when I about 35 I would be going into sportscar racing. I will be 35 in November. I am enjoying it lot driving for Jaguar at ALMS. (6) How competitive is the GT series in ALMS? A – Very competitive. Good drivers and teams and a big support from the car and tires manufacturers. (7) Do you still want to compete in the IndyCar series? A – If I have a good opportunity, it will be nice. (8) How did it feel to set the fastest race lap in GT at Mosport, and did you know that fellow ChampCar ex-pat Sebastien Bourdais also set the fastest race lap at the Edmonton Indy on the same weekend? A – It was good to run fast at Mosport. The Jaguar RSR team did a good job. It was my first time there and loved the track. I always like to race in Canada . I didn’t know that Seb set the fastest lap, but I wish that the races were in a different weekend, and I could race both. It’s August and this weekend it is all about the dedicated road track outside of Cleveland known as Mid-Ohio. The two top technology major automobile racing series converge, showcasing the best drivers American auto racing has to offer driving everything from open wheel, prototype closed body, and modified sports cars. IndyCar Series and the American Le Mans Series repeat in a double header event as thay did earlier in the year at Long Beach California. The JaguarRSR team looks to carry the momentum of posting the fastest GT race lap in the last event at Mosport to Mid-Ohio this weekend. With track veterans behind the wheel of the pair of JaguarRSR XKR GTs, the team will be looking to make additional strides to move up the 16-car GT field set to take the green flag in the fifth round of the 2011 American Le Mans Series presented by Tequila Patron. The Mid-Ohio Sports Car Challenge is scheduled for 3:30 p.m. ET on Saturday, August 6 with ESPN2 airing the race starting at 10 p.m. ET on Sunday, August 7. Live video coverage on race day will be available at 3:15 p.m. ET on ESPN3.com in the US, and americanlemans.com for international viewers. Canadian fans may also watch live coverage on Rogers Sportsnet. Worldwide radio coverage will be available on American Le Mans Radio at americanlemans.com. or more information on the broadcasts, go to americanlemans.com/tv. 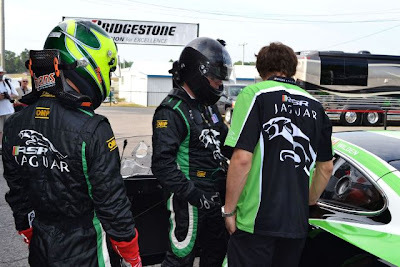 Five Questions With ALMS GT JaguarRSR Team's Rocky Moran Jr.